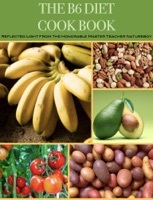 The Ultimate Cookbook for those seeking to return back to a natural earth-based diet. This Cookbook makes it easy to transition from the toxic consumption of animal products and processed foods to an organic way of eating. The B6 Diet is a well-rounded, balanced meal plan that consist’s of fruits, vegetables, nuts and seeds. Aside from delicious, flavourful recipes, there is an abundance of valuable information available; such as the science behind food, the importance of Vitamin B6 and connecting back to Nature. Spice up your life with this culinary classic from CarbonNation.